With this article, we would like to open a new series on forensics where we want to write about techniques used by the police, forensic technicians and detectives. Each article will come in the same order as actual activities are conducted. The first topic in the series is investigating and securing a crime scene. A perfect crime, understood as a wrongdoing without leaving any traces, is not possible. Each human activity leaves some kind of a trace. These can be fingerprints, shoes imprints in mud, sperm, skin, saliva, scent or fibres from clothes but also the impression of a person left in the mind of witnesses or victims (these are called traces in consciousness). A perfect crime does not exist. 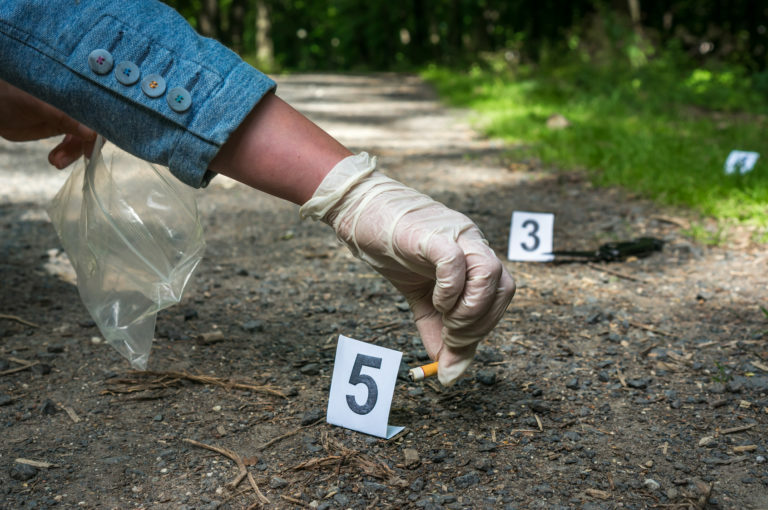 But quite often, due to the thoughtlessness of officers or detectives investigating a crime scene, traces are omitted or even destroyed what hinders the possibility of finding the perpetrator. There are many unsolved mysteries that cannot be closed due to the fact that they were taken care of by unqualified persons. That is why modern forensics has developed extremely rigorous rules to follow in order to secure as many pieces of evidence as possible and do not damage anything. 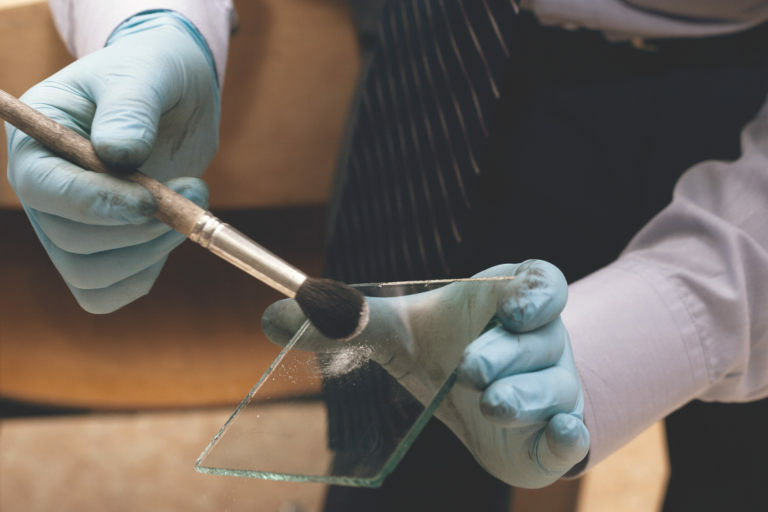 Positive securing of a crime scene entails, in short, all activities undertaken on a scene before the actual survey of it, to avoid destroying evidence and rescue people’s life. Examples of positive securing are giving first aid to the injured and getting them out of the scene (if possible), defusing a bomb, extinguishing a fire or stopping a gas leakage. In an ideal situation, a positive securing is not needed, but in practice it usually is. 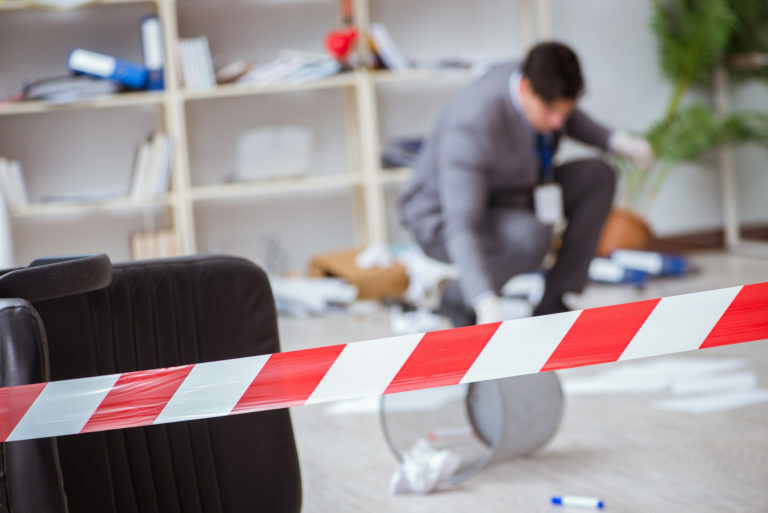 When there is no more necessity to interfere with the crime scene, it needs to be properly secured not to be accessible to unauthorised persons (by using fences or closing the door), from weather conditions and other factors that may have a negative impact on the traces. Theoretically, this has to be done at the beginning, but some of these activities are done in the process of an actual survey (e.g. closing a window when it’s raining is possible only after it has been thoroughly photographed and was inspected for traces like fingerprints on its glass, window sill or frame). On the other hand, sometimes conditions may force quick actions even at the risk of contamination, moving or other interference in the evidence material (like the necessity of covering the murder weapon with a clean dish to secure it from snow or rain or covering a dead body to make it safe from the weather, insects and animals). It’s a cliché to say that some cases are more complicated than others and the ability to properly assess a case is vital for further investigation. Forensic investigation in its most advanced form can be extremely complicated, time-consuming, engaging many specialists and terribly costly. On the other hand, savings made on the superficial inspection of a crime scene may be ostensible if the case turns out to be more complex and significant. Then investigation would need to be conducted again using evidence of lesser quality and engaging more staff. The investigation should retain the state of the scene before it was commenced. The investigation should be managed by one person, whose orders need to be followed. Only this division of responsibilities guarantees order. If the crime scene involves an outside and inside area, the investigation should first be conducted outside and in the daylight. All activities and collected traces should be properly documented. WHAT has happened? Is it a crime, accident or maybe a suicide? WHERE did it happen? Did it take place in one spot or more? WHEN did it happen? Was it one-time, reoccurring, sudden or stretched over time? WHY did it happen? What were the motifs? Once the crime scene is secured, next activity is proper preparations for meticulous research. Depending on the significance and complexity of the case, this step may be limited to looking around a crime scene and choosing the best place for taking photographs (in case of a burglary) but may also entail using specialised coveralls that limit possibility of contamination, choosing a place for a camera stand, setting lighting, preparing specialised equipment and calling experts (to e.g. examine blood traces). During this step, fixed points of reference need to be determined, that is characteristic points, surfaces or lines according to which location of objects is further given in the documentation. Depending on a case, the investigator may choose one of the four main methods of investigation. Objective method – involves detailed, systematic and gradual examination of the whole crime scene in a strictly set order (e.g. from the eastern to western wall). This method is the most precise but requires much time and attention. Subjective method – sometimes on a crime scene an object stands out and requires instant activities (e.g. a dead body, bloody knife in the middle of a room or a mysterious suitcase). The investigator may decide to examine these obvious traces first, what can enable a pursuit after a suspect. Centre method – the investigator commences examination from the outside of the marked area and towards the centre in a spiral movement. Centrifugal method – is the opposite of the centre method. The examination is done from the centre of an area and a gradually widening range. It’s a bit similar to the objective method, as it’s the investigator that decides where the ‘centre’ is located. Before taking any actions, a crime scene needs to be comprehensively photographed from appointed points to provide its most accurate state. Then, as traces are revealed, each one needs to be photographed, preferably together with its location to the fixed points of reference and other pieces of evidence. Some traces are noticeable with the unaided eye. A bloody knife or a gun on the ground, blood stains on a wall or a dead body in a bed are quite obvious. But not everyone may know that every detail is extremely important. The location of a gun, size and look of the stains – they all may provide an answer to one of the seven golden questions. Traces visible with the unaided eye are called macrotraces. The other type, similarly important, is a microtrace – trace that is not visible without special technique and equipment (though hair is categorised as microtraces even though it’s noticeable without a magnifying glass). These are fingerprints, imprints of other body parts (like lips), some biological traces (skin, blood spots) and microdamage of devices and tools. The traces can be collected with a special brush, available at our store. Next article in the series is going to be about the techniques of revealing and securing traces. During an investigation, it’s very important to make documentation that lets fully reconstruct the crime scene. It is a common practice to, except for taking photos, make different sketches (like a sketch of a window with bullet holes). Various audio and video recordings also come in handy (conversations with witnesses), and finally notes made on the spot. As you can see, proper forensic investigation of a crime scene is not that easy. It’s no wonder that forensics training is so long and requires much effort. If, after reading this article, you still think that it’s a piece of cake, you will be shocked to learn that this description was considerably shortened and forensic textbooks on the subject of a crime scene investigation (even without collecting evidence) are really thick! In the next article, we are going to focus on collecting dactyloscopic traces, retaining the scent of the perpetrator and why lips imprints are treated like fingerprints.